NASA’s Search for Extraterrestrial Genomes –Was There an Earth-to-Mars Microbe Shuttle? Scientists confirmed this week that rocks collected recently in the Moroccan desert came from the Red Planet. 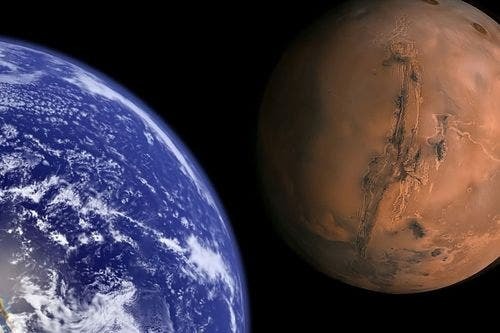 A little-known fact is that each year Earth is hit by by half a dozen or so one-pound or larger rocks that were blasted off the surface of Mars by large impacts and found their way into Earth-crossing orbits. Nearly 10% of all rocks blasted off into space from Mars end up crashing into Earth. This natural "interplanetary transportation system" begs a fascinating question: If primitive and nearly indestructible micro-organisms exist on a given planet, must they by definition as a natural act or nature, travel to their immediate solar-system neighbors? In 1976 the Viking landers had instruments onboard that could measure the composition of the Martian atmosphere. In the early 1980s, a meteorite was investigated and found to contain trapped gas inside, which when analyzed, was shown to be a match to what the Viking landers found in the Martian atmosphere. And further, it's been shown that the Martian atmosphere composition is unique in the solar system. There's no other planet or object or moon that has quite the same composition of atmosphere. So finding this trapped gas in the meteorite is a fingerprint that tells us that it comes from Mars. Scientists think it's possible that one or more of those rocks might have contained tiny microbes that successfully made the journey from one planet to the other. In 2018, they plan to test this hypothesis by searching for Earth-like DNA under Mars' surface. The NASA-funded project, called the Search for Extraterrestrial Genomes (SETG), is being led by MIT scientists including engineer and scientist Christopher Carr. The researchers are designing a device that can detect and identify nucleic acids, whether they be in Martian ice, brine, or soil. Although any organic material on the surface would likely have been destroyed by ultraviolet rays and radiation, DNA hidden underground could remain viable for about one million years, the scientists estimate. While most scientists expect organic materials to be on Mars, it's more difficult to predict what exactly those materials might be. In the SETG project, the researchers are focusing on specific genes that are fairly common in life on Earth. If there is DNA or RNA on Mars similar to that on Earth, then the new device should be able to find it. "We would feel awfully silly if we spent a lot of time looking for something that was very different and didn't spend time looking for something that was very similar," Carr said. "Life could have arisen independently, but that is not the most likely scenario." In two years, the researchers plan to test the DNA-detecting technology on Earth in locations including the Atacama Desert in Chile and in the cold, dry valleys of Antarctica, where the conditions are similar to those on Mars. Then they plan to fly the device on a joint NASA-ESA mission to Mars, projected to launch in 2018. Recent research on lunar rocks discovered in Antarctica has shown that rocks greater than 10 kilograms in mass could be ejected from terrestrial planets -rocks capable of carrying living microbes- and survive the searing violence of the launch. Over the history of the Earth, billions of football-sized rocks have landed on its surface, some only slightly heated by the launch, reaching Earth in a matter of a few months. A recent study by a team of scientists at Oregon State University of a meteorite that originated from revealed a series of microscopic tunnels that are similar in size, shape and distribution to tracks left on Earth rocks by feeding bacteria. Although the researchers were unable to extract DNA from the Martian rocks, the finding nonetheless adds intrigue to the search for life beyond Earth. Martin Fisk, a professor of marine geology in the College of Oceanic and Atmospheric Sciences at Oregon State University and lead author of the study, said the discovery of the tiny burrows in the meteorite do not confirm that there is life on Mars, nor does the lack of DNA from the meteorite discount the possibility. "There are two possible explanations," he added. "One is that there is an abiotic way to create those tunnels in rock on Earth, and we just haven't found it yet. The second possibility is that the tunnels on Martian rocks are indeed biological in nature, but the conditions are such on that the DNA was not preserved." More than 30 meteorites that originated on have been identified. These rocks from have a unique chemical signature based on the gases trapped within. The noble gas trapped in glass in the meteorites serve as a "fingerprint" that matches the composition of the Martian atmosphere measured by the Viking Mission spacecraft that landed on in 1976. These rocks were "blasted off" the planet when was struck by asteroids or comets and eventually these Martian meteorites crossed Earth's orbit and plummeted to the ground. One of these is Nakhla, which landed in Egypt in 1911, and provided the source material for Fisk's study. Scientists have dated the igneous rock fragment from Nakhla – which weighs about 20 pounds – at 1.3 billion years in age. They believe that the rock was exposed to water about 600 million years ago, based on the age of clay found inside the rocks. "It is commonly believed that water is a necessary ingredient for life," Fisk said, "so if bacteria laid down the tunnels in the rock when the rock was wet, they may have died 600 million years ago. That may explain why we can't find DNA – it is an organic compound that can break down." Fisk and his colleagues have spent more than 15 years studying microbes that can break down igneous rock and live in the obsidian-like volcanic glass. They first identified the bacteria through their signature tunnels then were able to extract DNA from the rock samples – which have been found in such diverse environments on Earth as below the ocean floor, in deserts and on dry mountaintops. They even found bacteria 4,000 feet below the surface in Hawaii that they reached by drilling through solid rock. "Several types of bacteria are capable of using the chemical energy of rocks as a food source," he said. "One group of bacteria in particular is capable of getting all of its energy from chemicals alone, and one of the elements they use is iron – which typically comprises 5 to 10 percent of volcanic rock." The igneous rocks from are similar to many of those found on Earth, and virtually identical to those found in a handful of environments, including a volcanic field found in Canada.